More than any year in recent history, it seems like there are more players with medical or orthopaedic concerns that could affect their selections in the upcoming NFL draft. Prateek Prasanna and I created a list of some of those athletes and explain how those injuries or medical conditions could give teams cause for concern. We will post two or three each day until the conclusion of the draft and then summarize the players’ ultimate selections. • Milliner suffered the injury at some point during his final season at Alabama, but it did not force him to miss any time. • He participated in all drills at the NFL Combine except for the bench press. • He underwent surgery to repair the torn labrum in his shoulder on March 12, after the NFL Combine. • ESPN’s Adam Schefter recently reported that Milliner has had five surgeries, including an arthroscopic knee surgery, sports hernia surgery, tibial stress fracture, and surgery on both shoulders. • Many teams expected him to make a full recovery from the most recent shoulder surgery by the start of training camp. Reports have started to surface that he might not be ready that soon. “We haven’t been able to do the rehab like I want to because I’ve been going to different teams. But once the draft is over, I’ll be able to start to rehab it and try to get back on track,” Milliner told reporters. • Many draft analysts predict that his draft position should not be a concern. The labrum is the cartilage bumper surrounding the glenoid (socket). It has stabilizing and shock-absorbing roles in the shoulder. 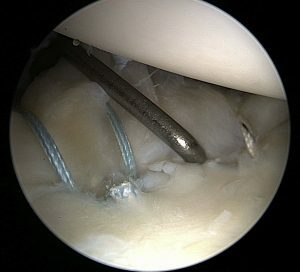 Arthroscopic view of the shoulder as the surgeon uses a probe to assess the stability of the sutures and anchors used to repair a torn labrum. Tears of the labrum can be treated with surgery to smooth out frayed tissue, which has a fairly quick recovery. The shoulder would not need to be immobilized, and the athlete can work to regain motion and strength almost immediately. On the other hand, labral tears where the labrum has been pulled off the glenoid require repair of the labrum to reattach it. Recovery and rehab are much slower in those cases. The athlete must keep the shoulder immobilized to allow the sutures and anchors attaching the labrum to the glenoid to heal before advancing shoulder motion. The recovery and return to football process usually takes 4-6 months for full labral repairs. Labral repairs have good results for return to sports, but surgeons and therapists must advance the athletes slowly to avoid damaging the repair early. • Many mock drafts listed Lotulelei as a top 3 overall pick before the NFL Combine. • ESPN’s Chris Mortensen he reported would not be allowed to work out Monday at the scouting combine. He was found to have a low ejection fraction during an echocardiogram performed as part of the physical examination. His echo reportedly showed a left ventricle ejection fraction of 44 percent. 55-70 percent efficiency is thought to be a normal range. • His agent, Bruce Tollner, said that NFL Combine officials advised Lotulelei not to participate until he consulted a specialist. • USA TODAY quoted an anonymous source who speculated that Lotulelei’s low ejection fraction might have been caused by dehydration, too much sodium in his diet, or losing ten pounds in the three days before the NFL Combine. • Lotulelei underwent a repeat echocardiogram in Utah, and his cardiac efficiency had reportedly improved. – speculation that a viral infection might have caused a temporary drop in his ejection fraction. 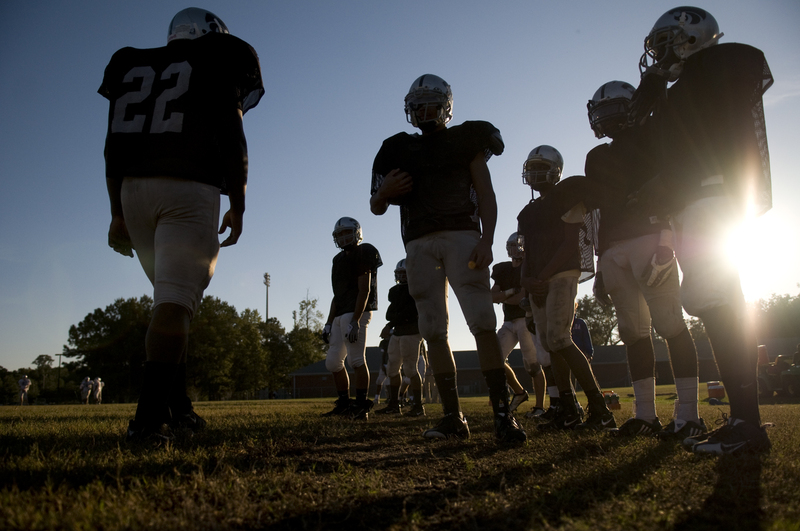 Sudden cardiac death is one of the most tragic events among young athletes, and it is more common than sports fans might think. The Centers for Disease Control and Prevention estimates that approximately 2000 patients younger than 25 years will die of sudden cardiac arrest in the United States each year. Estimates for the incidence rates of sudden cardiac death during sports range from 1 in 25,000 athletes to 1 in 200,000. 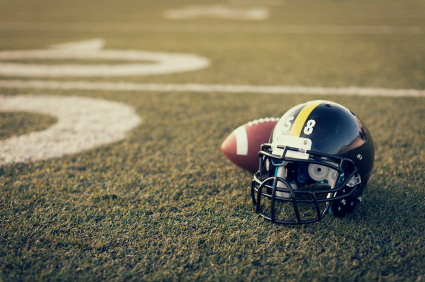 NFL teams and their doctors attempt to identify athletes at risk for sudden cardiac death or any other medical conditions that could later affect their health or performance on the field. Since a large percentage of athletes who ultimately suffer a sudden cardiac death exhibit no symptoms before the event, medical tests to reveal unknown heart conditions are standard in the NFL. If Lotulelei’s formal cardiac workup by specialists in Utah had revealed a chronic heart condition, he likely never would have been cleared to return to football. 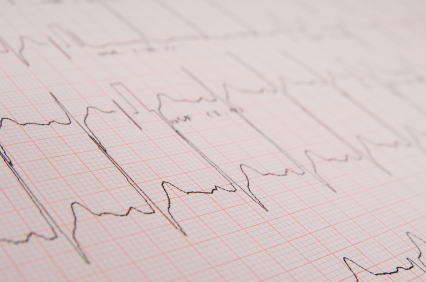 If all follow up tests are normal now, his initial echocardiogram results might have truly been caused by some sort of temporary condition – possibly a viral illness or one of the other causes mentioned above. If his cardiac tests are normal now and over several follow up tests, then Lotulelei would be expected to return to football with no limitations. It would also seem likely that his draft stock would not slide much at all. • As a freshman linebacker at the University of Southern California, he suffered what was initially called a neck sprain after a routine hit in a game against Oregon in 2009. • Trying to tackle an Oregon wide receiver, Jones’ head collided with a teammate’s hip. “I felt my shoulders go numb,” he later told ESPN the Magazine. • Evaluation by a specialist revealed “mild” spinal stenosis – or narrowing of the spinal canal – between C4 and C5. The doctor reportedly told Jones he could return to football. • USC team doctors refused to clear the linebacker for contact and recommended that he retire from football. • His high school coach, Carver High coach Dell McGee, contacted Georgia, Florida State and Alabama about Jones transferring and playing for them. All responded that if doctors cleared him, they wanted the linebacker to play there. • Georgia team doctors officially cleared him to play, and he transferred to the University of Georgia. • Jones recently denied that he has had any neurologic symptoms since the initial injury. Spinal stenosis is a condition in which the spinal canal is narrower than normal. The narrowing of the space around the spinal cord and the nerves coming out of the neck can cause numbness, tingling, weakness or pain that shoots down the arm into the hand and fingers or down the leg. Participation in contact and collision sports with spinal stenosis carries some risk of nerve damage. Hits to the top of the helmet that deliver a direct axial compression load to the cervical spine or that forcefully flex or extend the cervical spine could potentially cause nerve injury or even permanent paralysis. Return to sports after an injury that caused neurologic symptoms is controversial, and players might get different opinions from different surgeons. If an athlete recovers fully with no motor or sensory deficits, many surgeons will allow contact sports. Repeated episodes usually lead to a formal recommendation that the athlete stop playing contact and collision sports such as football. Stay tuned for Part 2 of the NFL Draft 2013: Risk or Reward series tomorrow.